LAWRENCE – The world’s premier conference for linguistic research on African languages will be hosted this year at the University of Kansas. More than 200 attendees from the U.S., Africa and Europe will travel to Lawrence for the 45th Annual Conference on African Linguistics from April 17 to 19. The conference is hosted by the KU Department of Linguistics. 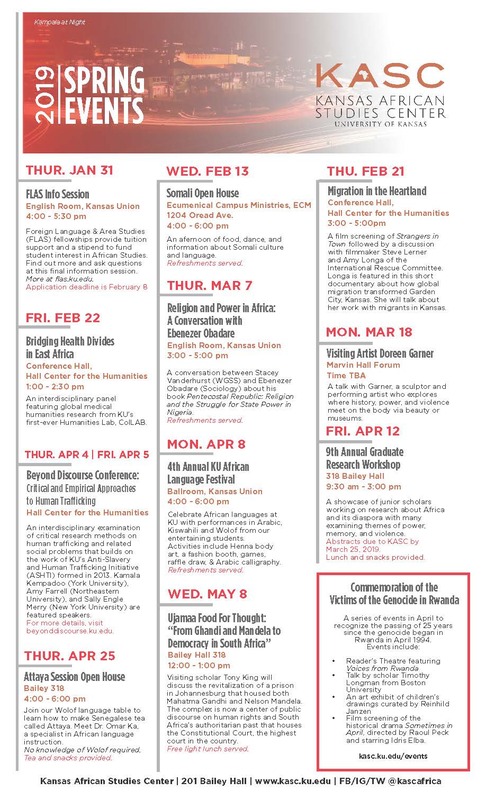 A unique feature of this year’s conference is a special KU undergraduate session dedicated to increasing awareness of language endangerment and the plight of Africa’s endangered languages. Registration costs will be waived for all KU students. Interested students should contact Harold Torrence at 785-864-2882 or acal45@ku.edu for more details. In addition to a robust schedule of conference sessions, two KU linguistic researchers have organized a special workshop called “Africa’s Endangered Languages: Documentary and Theoretical Approaches.” The workshop, featuring major speakers from the U.S. and abroad, will emphasize the synergistic relationship between documentation and linguistic theory in endangered African language research. It’s supported by funding from the National Science Foundation secured by Torrence, associate professor, and Jason Kandybowicz, assistant professor. Participants will include well-known researchers, students, community language activists and independent researchers. The conference emphasizes both descriptive and theoretical perspectives from all sub-disciplines of linguistic inquiry as well as both narrow and comparative/cross-linguistic analyses of African languages. KU faculty and graduate students giving presentations represent a variety of disciplines: Carlos Nash, assistant professor, Department of Anthropology; Ibrahima Ba and Mfon Udoinyang, doctoral students, and Torrence and Kandybowicz, Department of Linguistics. The conference also provides African scholars, a highly underrepresented group in academia, and junior researchers an opportunity to present their work and get feedback from both their peers and established researchers. More information about the conference is available at the 45th Annual Conference on African Linguistics’ website. The conference is supported by the National Science Foundation, the Kansas African Studies Center, the College of Liberal Arts & Sciences and the Office of the Provost. All presenting departments are in the College of Liberal Arts & Sciences, which encourages learning without boundaries in its more than 50 departments, programs and centers. Through innovative research and teaching, the College emphasizes interdisciplinary education, global awareness and experiential learning. The College is KU's broadest, most diverse academic unit.